Yikes…that is where all the hard work takes place. Let’s see how this baby turned out, shall we? 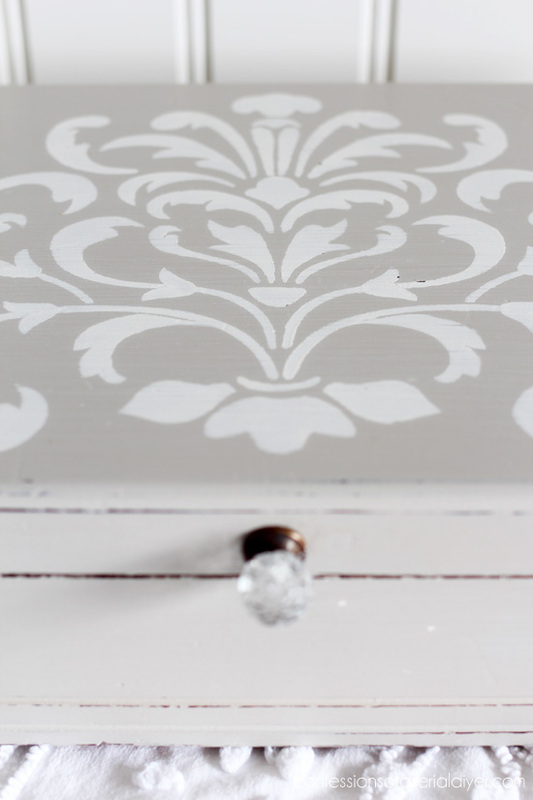 Ooh la la…stencil to the rescue! I’ve included a few affiliate links so you can find the products I use. It dries pretty fast. Then I sanded the filled holes smooth. 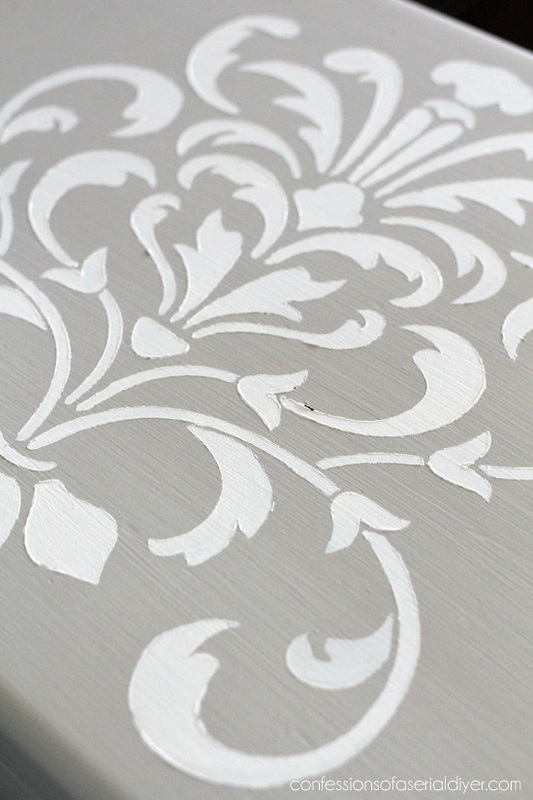 I love using these soft hues for pieces that will possibly end up in a bedroom. 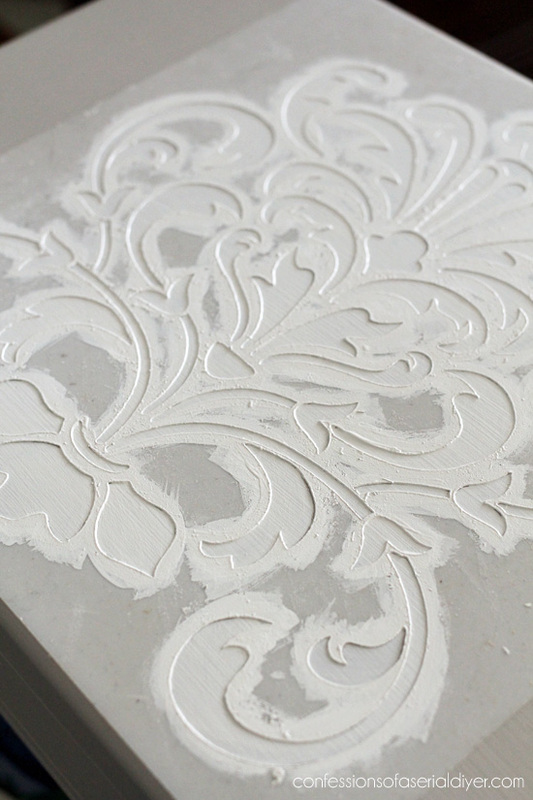 This is one part Annie Sloan’s French Linen, and two parts Pure White. 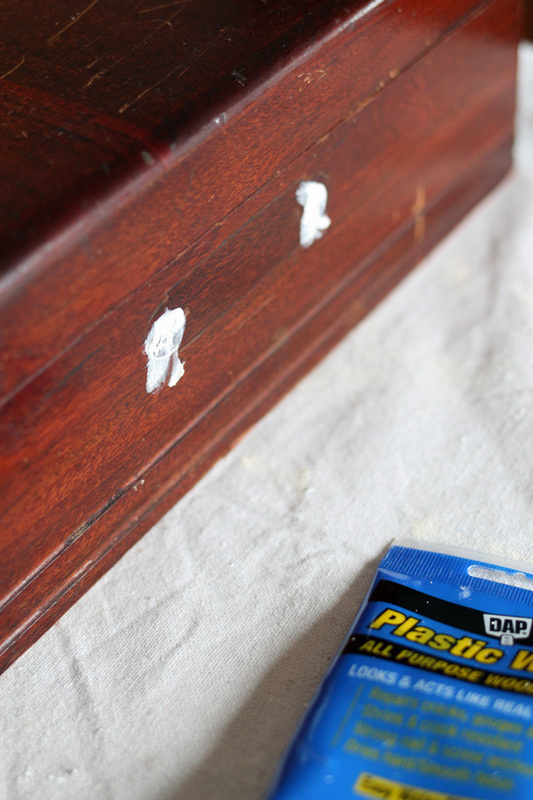 After sanding the entire box with 220 grit sandpaper, I sealed the surface with Annie Sloan’s clear soft wax. See in detail how I line the inside of these boxes in this post. The only difference is I used Matte Mod Podge instead of hot glue to adhere the lining on the sides here, and I think I like that better. 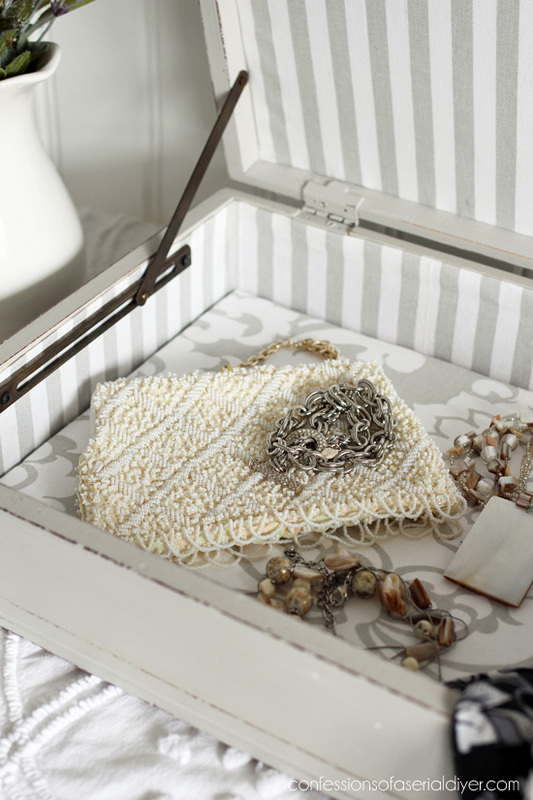 These can hold all kinds of things like precious mementos, photos, jewelry, and other accessories. 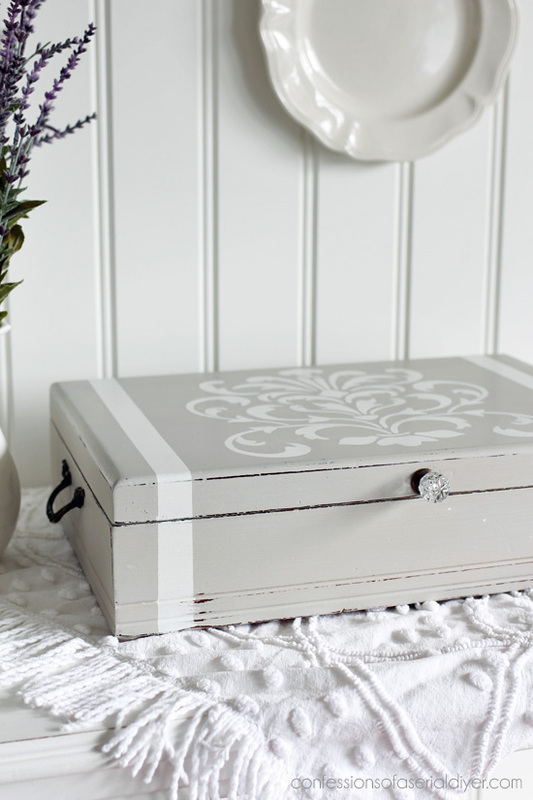 These boxes have so many possibilities, and I still have two more in my storage room! Not bad for a $3 thrift store find, right? UPDATE: You can see how I repurposed this inbox HERE now! Wow what a difference. 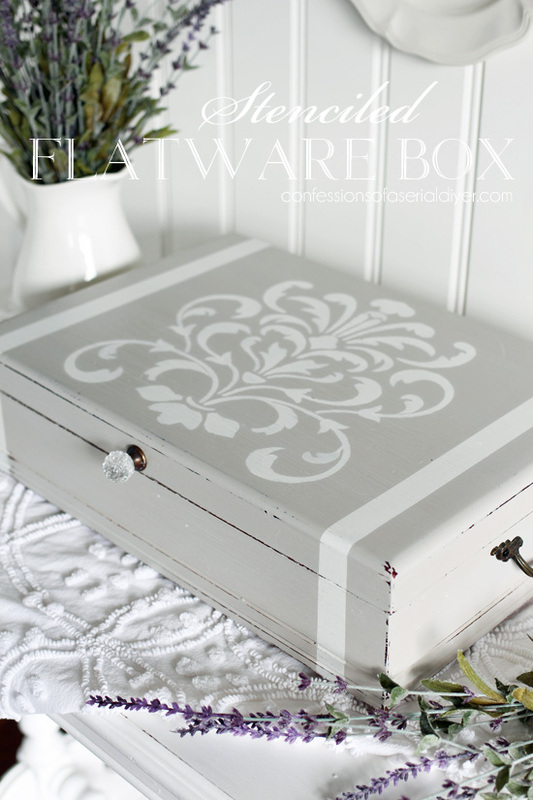 I actually have a old silverware box to redo, I know what my project will be this weekend. I LOVE how that turned out. Thanks for the great inspiration. Another winner Christy! 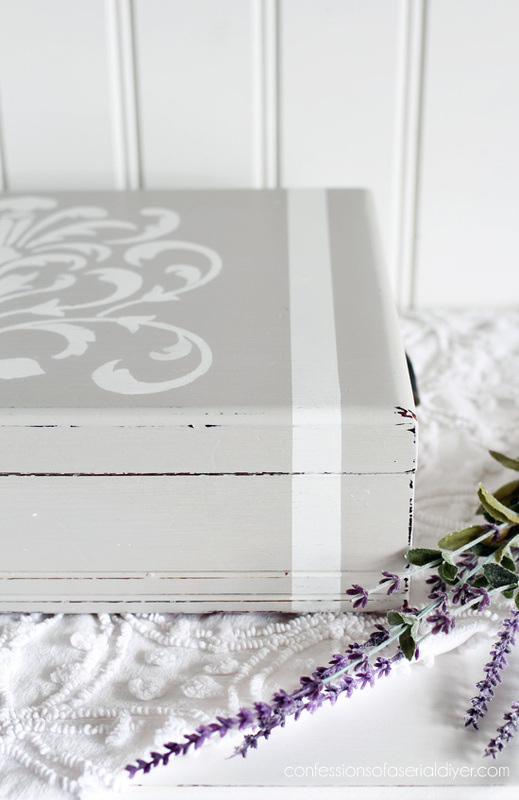 Beautiful box that someone is going to snap up in a heartbeat. 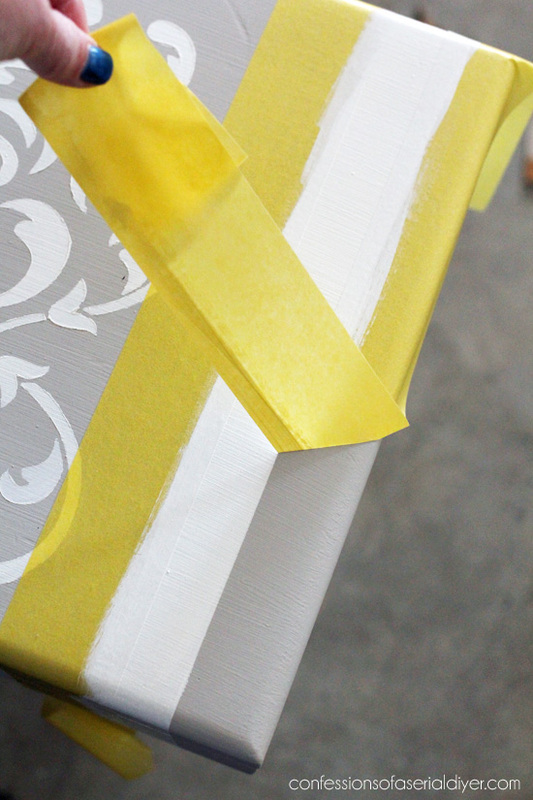 I like the use of the modpodge (or acrylic matte medium) to adhere the fabric to the inside. I want to try a small roller with a stencil soon. Love your colors as well. Enjoy your week & create on! 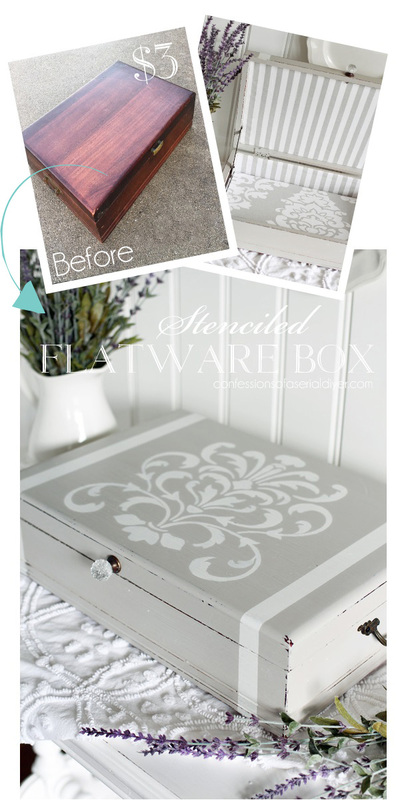 Another great flatware box makeover! Someone is going to love this and I’ll bet it won’t last long at all in your booth. What a great transformation! I have a stash of silverware boxes myself but have only ever repurposed one. You have inspired me to pull them out and get to work! 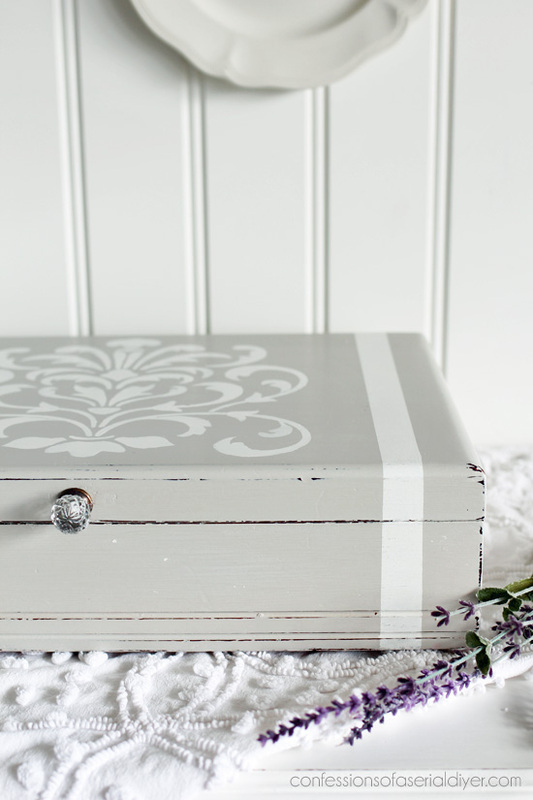 Can’t wait to see what you do with your letter box – I have several of those in need of an update too! Thanks for sharing 😊! This is beautiful!!! Love this kind of transformation. Outstanding!!! Love this one, Christy! 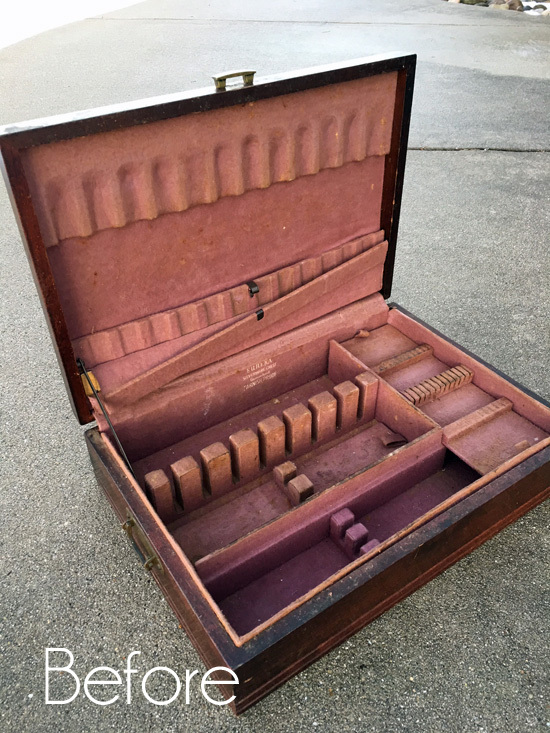 Good thing this isn’t smell-o-vision, because those old flatware boxes often smell as bad as they look inside. I don’t think anyone can truly appreciate how dramatic the change is until they’ve seen what it takes to get that nasty lining out. Eeeeeew. Wow! Great make over. I too have a box given to me that I had forgotten about. I am now inspired to make it over. Thank you for sharing! Ohhhh…my goodness! That is over the top beautiful!!! It’s so pretty, Christy! 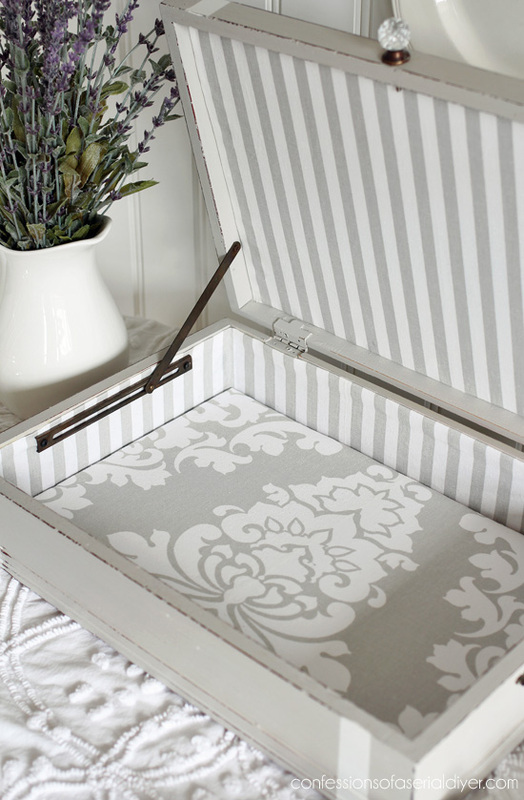 You always do such a lovely job on these flatware boxes. I’m currently working on one for my son’s wedding next month. Hope it turns out as pretty as yours (finger’s crossed). 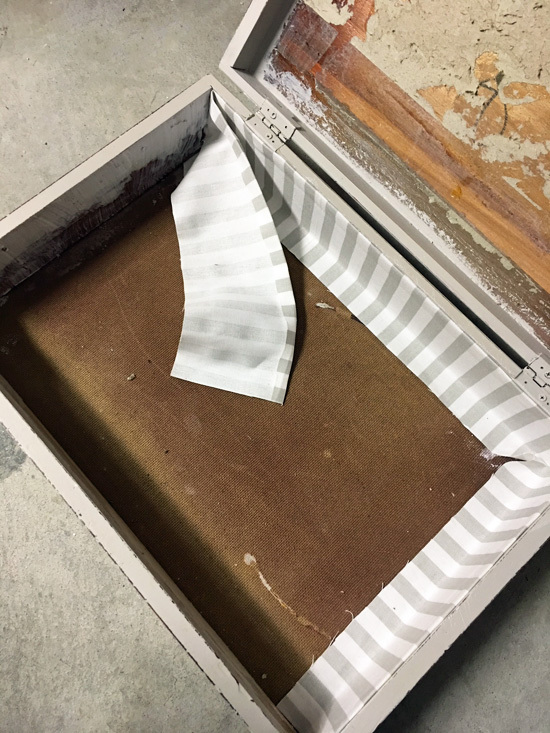 Did you have to prep the box (other than filling in the holes) before you painted it? Beautiful rehab. 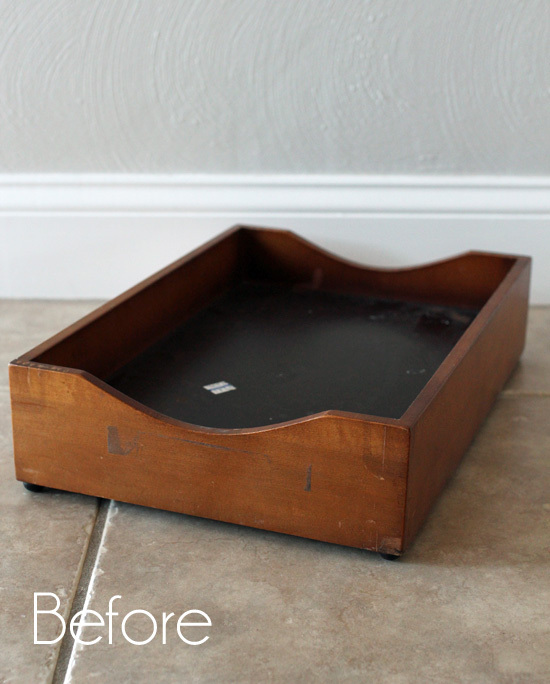 I can see this being used to hide all those remote controls from sight and keep them from being misplaced! I just love your blog. You’re so clever and up-beat! Thanks for giving us a little peek into your creative world. Boy could I kick my myself in the rear!! I just saw one of these that was just as ugly at Goodwill last week and passed it up because I wasn’t sure what I could do with it!! I think it was $3.00. Bet if I go back this week it will be gone. Sometimes when I see something like this I want to call you, or send you a picture and say, ” Christy, what can I do with this?” :0 Love what you’ve done and can’t wait to see what the in-box turns out be. That would be a great idea Christy!! Oh so pretty! 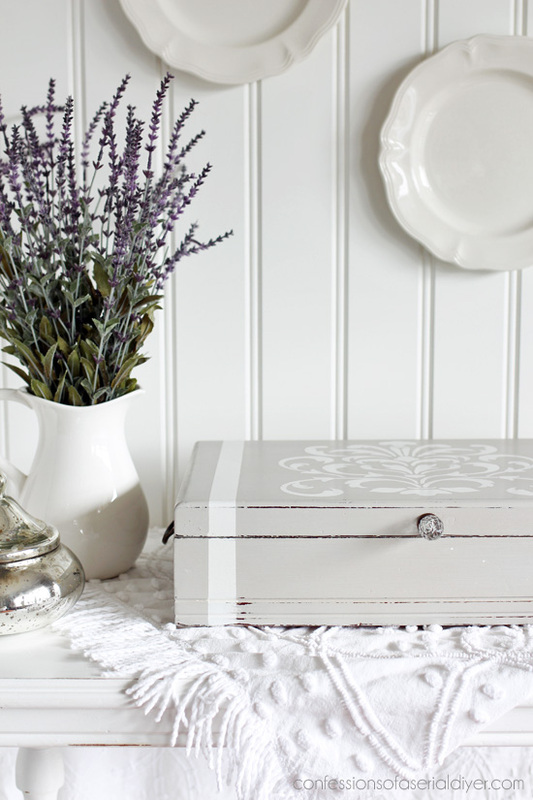 These little gems are perfect for storage and display. And I love that chenille throw with its pattern and texture. It looks great in all these photos. Have a wonderful week, and stay warm! So cute !!! Love it. I’m going to try and find one for myself. Where do you get your knobs and handles? 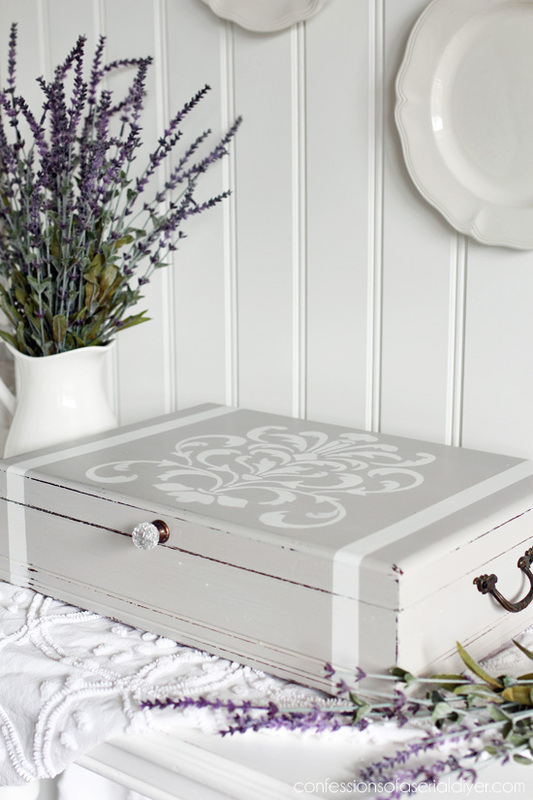 Hi Christy – I love your refashions of these cutlery boxes. I have my great aunt’s, and I’d like to do something like this on it, however, I’d still like to keep it for the silverware that came with it. Do you think I’d be able to do this up and still keep the original use? Would be much prettier for display if it was updated. 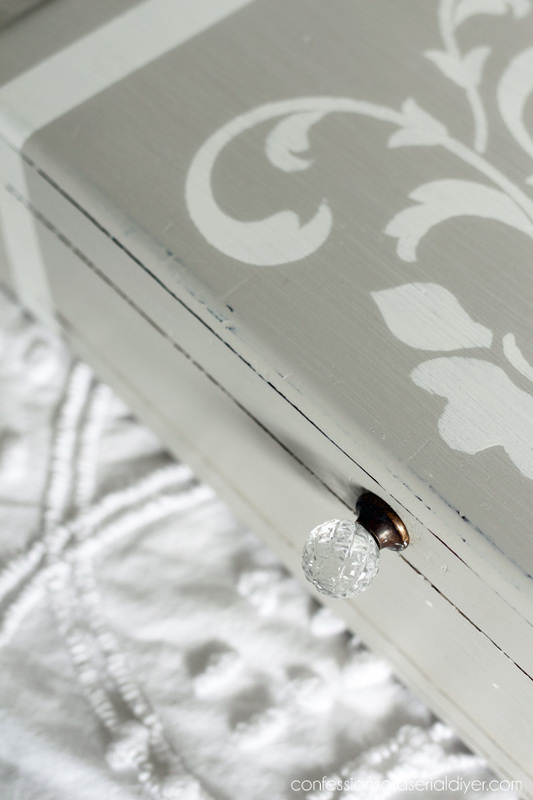 Love how it turned out and especially adore the glass knob. So pretty! OMG Christy! I was at my local Amvets today and I saw an “inbox” just like that. I stared at it and thought what could I do with this? I couldn’t think of anything, although I have bought things even though I didn’t know what to do with them and later was glad I did. Now after seeing your sneak peek I’m wondering if I shouldn’t go back tomorrow to see if it’s still there. I did buy a few things I will be posting on my blog in the next few weeks and I am so excited about my finds! Just finished a little stool on wheels. Hope you have a chance to check it out. SO pretty, Christy! 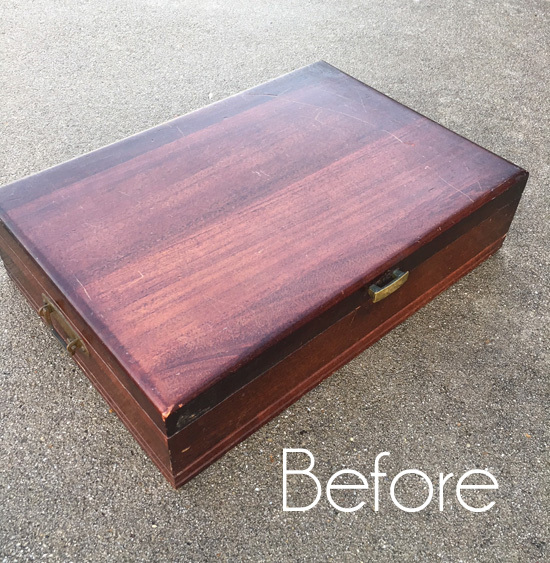 I have a box just begging for a makeover! 🙂 Soon! Thank you, Julie! How exciting… Only a couple days left, right? Oh, this is pretty! I absolutely love your makeovers! Oh no! I can’t tell you how many things I’ve gotten rid of over the years that I wish I had back! You inspire me to want to get so many things done. 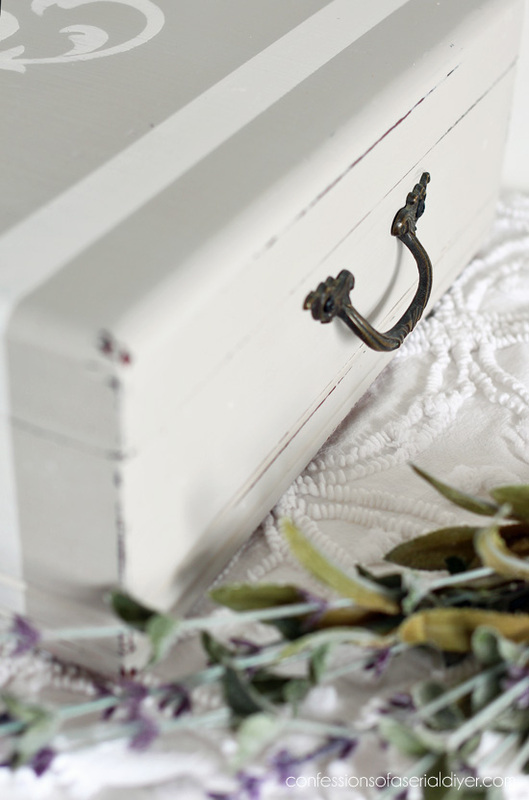 I’ll be on the lookout for a box because I could set it on the coffee table to hide all the hand sewing or knitting that I work on at night. Would be so much neater! I’ve been scrolling backwards to see all your wonderful makeovers! Christy, this such a beautiful transformation. Very lovely. 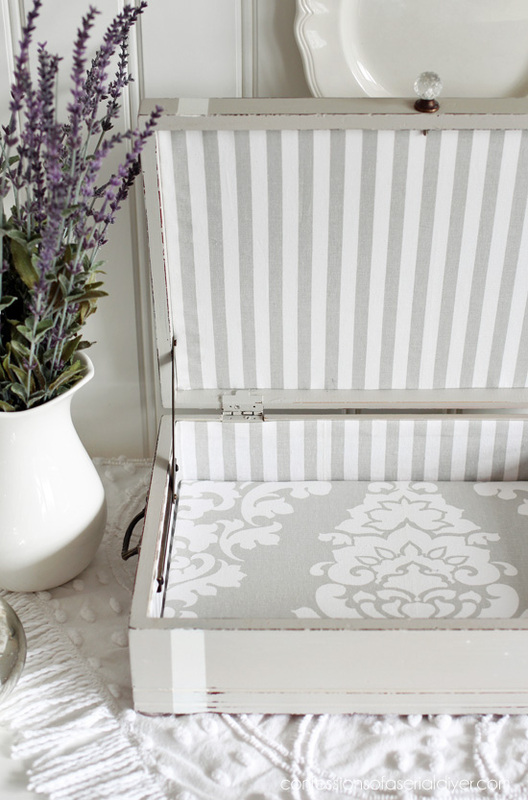 So pretty, love the gray and white combo! I love everything you do! So beautiful!